It has been a few weeks since I wrote about anything and so much has been going on. I told you that my oldest sister Elyssa and her daughter Lola were in town from North Carolina visiting and while they were here they watched me ride my bike a lot. I hung out with friends a lot at the race tracks. I love going to different tracks and hanging out with different friends at each place I go. 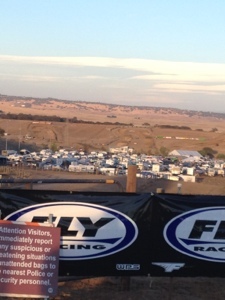 This picture was taken in Hollister at the GP track. I also went with my Mom, my Sisters and Lola to the Zoo. We had a lot of fun running around and showing Lola all of the animals. My sisters and I ran around and acted crazy the whole day. 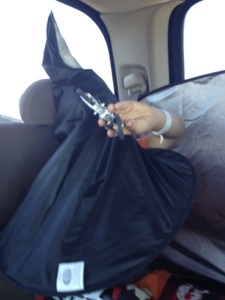 When I was practicing my bike cut out going through a turn and I tipped over. No big deal, but when I picked up my bike I noticed that my finger was pointing the wrong way. Yep, broken finger. The doctor gave me a shot and then set the finger back in place and put it in a cast to heal. My Grandparents took my Great Grandpa and my Uncle to the Sacramento Fish Hatchery. It was really cool to watch the salmon jump up the ladder and fight to get to the top to lay their eggs. It was really crazy to watch. My parents and I went bowling. We all had a lot of fun but I think we all agreed that our family are never going to be professional bowlers. This year for Halloween, it was the last year that my school walks in the parade through my Mom’s work to get candy. (Next year I switch to middle school) I didn’t know what I wanted to be, I was thinking I would be the guy from breaking bad but that didn’t fit me very well. I decided to go with something completely crazy and different from what I could ever be in real life……A Nerd. Halloween night when we went trick-or-treating we took our golf cart to the golf course down the street that my Grandparents live at. We went with my friend Marks family and all 8 of us piled into the golf cart and ran crazy from house to house getting candy. 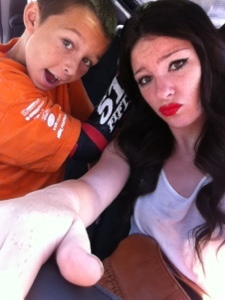 My parents and I went to Stockton to the sprint car races with some friends of ours. We had awesome seats and had fun watching the action. The 51 Fifty Energy Drink girls were at the races and I got to say Hi. I spent Thanksgiving with my family at my Aunt and Uncle’s house. I made sure to tell everyone that I was Thankful for my entire family and for dirt bikes! 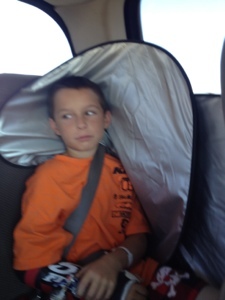 I jumped around to a lot of different things, but there is still more to come……. I am excited that my 51 FIFTY team has still let me take part in the week long event. 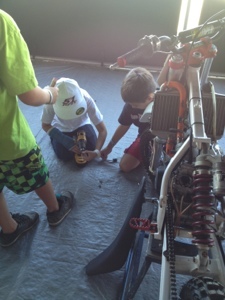 Sunday I took my bike to the track and as a team the bikes all got make overs. Sunday was move in day for all the riders and the lot was getting full fast. 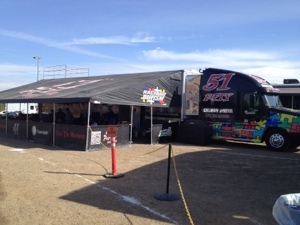 The 51 FIFTY rig looked awesome and I was very excited to see my bike under the tent. 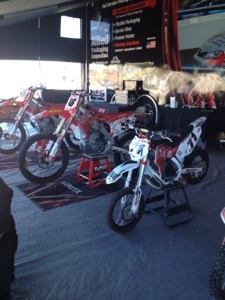 We are all sporting some very cool red and white graphics and all the bikes on the team now match. I love the new colors and design and can’t wait to see it on the track. 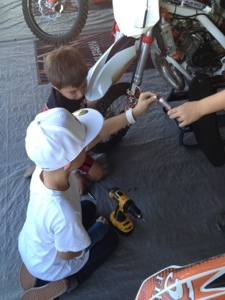 It was really hard working on my bike with only my left hand but we all worked together and it came out awesome. After we worked on bikes, we got to hang out and relax for a little. 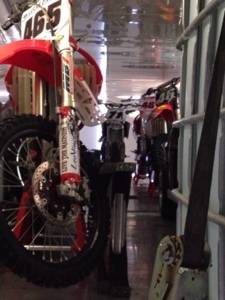 Then we put all the bikes upstairs in the hauler. It is really cool to see my bike up away with the pro bikes…..hoping to be on one of the pro bikes one day. 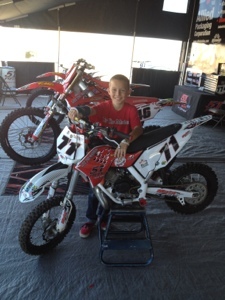 Thank you Larry from Moto Efx for the cool graphics, you did great….as usual. Thank you Micheal from 51 FIFTY for letting me be a part of Dodge even though I am not riding. You always make me feel welcome and I really appreciate everything you do for me. Later this week I will be back at the track not riding, but supporting my team. Check back later for the behind the scene look at Dodge from a spectator instead of a rider this year. Since I am not on the track supporting my 51FIFTY team I thought I would be like Dale and Brennan from the Step Brothers movie and MAKE A MUSIC VIDEO…..prestigue world wide! I took 7 songs that are currently on the radio, I changed some of the words to fit the drink and put it all together. 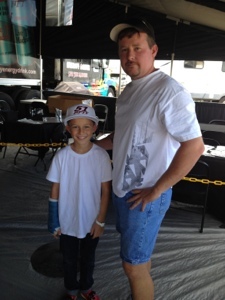 ….I promise I will stick with dirt bikes as soon as my arm is better. Since I broke my wrist and I haven’t been able to ride my dirt bikes, I think I might be going a little 51FIFTY! My Mom even says I have too much energy. 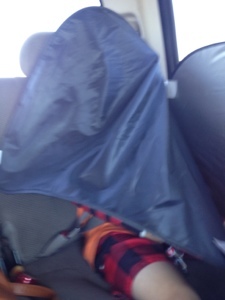 The other day we were driving in the car and I was bored, so I decided to play with the sun shade….and of course a dirt bike. 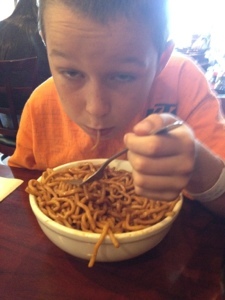 My family and I went out to dinner at Mongolian Bar-B-Q, and it was sooooo good. If you don’t know, you get to pick your own meats, vegetables, and noodles and then make your own sauce and watch them cook your creation. Of course I made mine without meat and without vegetables, so I had the most delicious noodles and sauce ever. 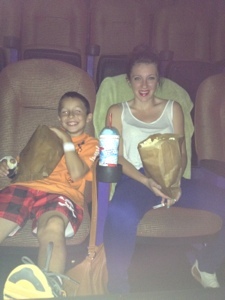 After dinner my family and I walked around the mall and then went to the movies to see Batman. The movie was really good and I can’t wait for the next one, I loved the ending! My sister and I have been doing some things together and we even went to lunch with some of our dirt bike friends and that was really fun. I have a doctor’s appointment next week to see how I am healing and when I can get back on my bike…..
Also I want to wish all my friends on the team luck this weekend at the Lake Elsinore Motocross race in Los Angeles. Make sure you watch the races and cheer on some really great guys! GOOD LUCK! THE TOP 10 THINGS I KNOW ABOUT 51 FIFTY ENERGY DRINK…AND YOU SHOULD TOO! 10). 51 FIFTY Energy Drink started selling in June of 2011. 9). Drinks were originally Sold in 8.4 oz cans in 3 flavors; Original, Sugar Free and EXTREME. In June of 2012 the Original and Sugar Free flavors also became available in a 12 oz sleek can. 8). Several blind taste testing sessions against competitors Red Bull, Monster and Rockstar have been easily won each time by 51 FIFTY. 51 FIFTY is priced better than any other leading energy drinks on the market. 7). While some ingredients are common in most energy drinks such as Taurine, Ginseng, Caffeine, and B Vitamins, 51 FIFTY also adds 2 natural herbs, the Astragalus and Maca Roots which no one else has. 6). The Maca and Astragalus Roots are known to increase energy, boost your immune system, strengthen vitality, improve sexual desire, and raise resistance against fatigue. 5). 51 FIFTY is connected with the Carlos Vieira Foundation which is a 501 (c)(3) organization in California. The main goal of the foundation is to raise money to help families living with autism. The campaign is called, Race for Autism”. 4). A percentage of every can sold of 51 FIFTY Energy Drink goes to the foundation to help families with autism by giving grants and donating money to autism research. Autism is a complex developmental disability that typically appears during the first three years of life and is the result of a neurological disorder that affects the normal functioning of the brain, impacting development in the areas of social interaction and communication skills. Both children and adults with autism typically show difficulties in verbal and non-verbal communication, social interactions, and leisure or play activities. 3). Race for Autism started in 2008 with a NASCAR team owned by Carlos Vieira. They raise money by conducting fundraisers and as of December 2011 they have raised over $250,000. 1). 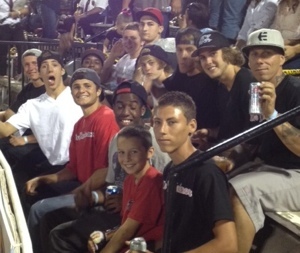 51 FIFTY is directly involved and sponsors sports such as car racing, motocross, BMX, skateboarding, bass fishing, & MMA. BECAUSE OF THE CONTINUED GENEROSITY OF SUCH AN AMAZING ORGANIZATION AND THIER CONTINUED EFFORTS TO SUPPORT ME AND MY DIRT BIKE RIDING…..51 FIFTY ENERGY DRINK HAS ENABLED ME TO BE ABLE TO ATTEND THE LORETTA LYNN NATIONAL RACE IN TENNESSEE. PLEASE MAKE SURE THE NEXT TIME YOU PURCHASE AN ENERGY DRINK YOU GRAB A 51 FIFTY…..
Saturday I spent the day helping my Dad work on bikes and we started packing to go to the World Mini Grand Prix that was coming up. Saturday afternoon my Dad took me to Stockton 99 Speedway to cheer on Larry from MotoEfx and Carlos from 51 Fifty Energy Drink. The race was soooo fun! Larry and Carlos gave us pit passes and I got to hang out with the teams. MOTO EFX: Larry and the Moto Efx team had wrapped like every car and hauler that was in the pits. The whole place looked amazing with the coolest graphics. 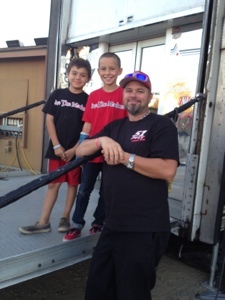 Larry’s rider, Jacob Gomes who drives the number 16 Sunnyvalley Meats car, made the race look too easy. He qualified first but because of the starting draw he started the race in fourth. Before long he took the lead and never looked back. Larry and his family let me hang out in the center of the track with them and I even got to wear the ear phones to listen to the team communication. THANK YOU MOTOEFX! 51 FIFTY: Carlos is the driver for the 51 Fifty Energy Drink car and he drove the wheels off his car. The team had problems with the car just before practice and got no testing time on the track. He was able to pull out a thirteenth qualifying position which was amazing. Carlos definitely passed the most cars of the night. The track was really difficult to pass on and Carlos battled all the way to fifth. What an amazing drive to the front! After the race I hung out in the pits more with the teams and before I left Carlos hooked me up with banners and drinks to take to the World Mini Grand Prix. THANK YOU 51 FIFTY! 5150 is the California Penal Code for someone who is a danger to themselves or to others…….AND IT IS ALSO THE NAME OF MY NEW SPONSOR! 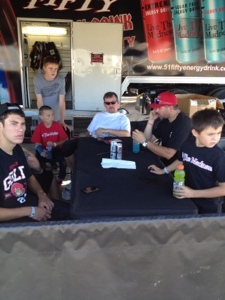 51 FIFTY ENERGY DRINK is a local beverage company committed to produce the hottest energy drink on the market. They utilize special ingredients like the Astragalus and the Maca Root, which is why people have switched from the old brands. Go to www.51fiftyenergydrink.com to find your local stores and start to LIVE THE MADNESS! ORIGINAL – SUGAR FREE – EXTREME . Not only is the drink superior to other energy drinks, Carlos and the 51 Fifty team are awesome. Everyone is really nice and they are committed to giving back. 51 Fifty Energy Drink donates a percentage of all sales to Race For Autism which directly helps families living with Autism, and they are affiliated with Supercross, BMX, Car Racing, MMA, Pro Fishing, Boarding, and more. I am very excited to be a part of such an amazing group of people and excited to help promote an awesome company. I am looking forward to a future of LIVING THE MADNESS! Are you someone that does not quit? Are you always pushing the limit? Are you unable to feel fear? Are you up for any challenge? Grab a can and LIVE THE MADNESS!